I was sad to leave Essaouira. I had met nice people and had learned my way around the medina and souks (not an easy task). Driss and I stopped by to see Latifa and Abduel and give them a gift before I got the bus to Marrakech. We had arrived at the end of their lunch but there was plenty left over, so they insisted we stay and eat. So glad we did. The rice is made yellow by a saffron-like colorant. (They are really into coloring their food.) Diced onion, tomato and shredded lettuce were sprinkled with oil and vinegar with a little slice of avocado on the side. 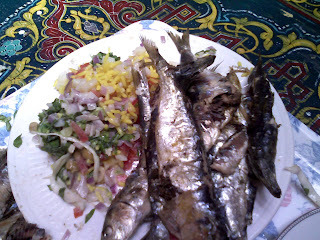 The whole fish was grilled, stuffed with charmoula. Good stuff. Wow, most of your recent posts look like amazing dishes! This is great research for your techniques as a chef. You’re very lucky to have met these incredible people to show you the trick of the local trade. Tell us more when you are back.